I’ve being doing some investigation, trying to understand why Ontario’s honey bee losses were so high in the winter of 2013/14. A reported 58% of total colonies were killed. I was intrigued by the high loss percentage for Ontario compared to other provinces (Table 1), and anecdotal reports of huge differences among individual beekeepers (range 0 to 100% loss). I’ve talked to many beekeepers and bee experts in Ontario and elsewhere. This column summarizes what I’ve learned. *Note: Calculated from the percent winter kill reported in the survey of beekeepers multiplied by the total number of colonies reported to Statistics Canada in the fall of 2013. 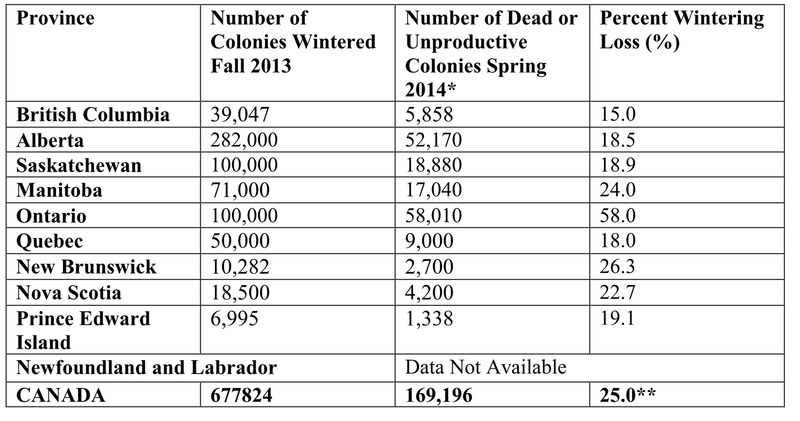 ** Note: Calculated as total estimated mortality in Canada divided by the total estimated number of colonies in Canada wintered. To begin, there is significant doubt as to whether the Ontario percentage was actually 58%. The Ontario Ministry of Agriculture, Food and Rural Affairs (OMAFRA) reports that its estimate is based on survey responses from only 97 of the 247 commercial beekeepers in the province, and only about 10% of all beekeepers. (About 90% of Ontario beekeepers are classed as non-commercial; ‘non-commercial’ being defined as having fewer than 50 colonies.) A substantial increase in the number of reported honey bee colonies in Ontario in the summer of 2014 (112,800, Statistics Canada, compared to 100,000 in late 2013, Table 1) makes one wonder if the 58% estimate isn’t too high. In addition, there is wide-spread speculation among beekeepers and other bee professionals that the Ontario Beekeepers Financial Assistance Program established in early 2014 (government payment of $105 per lost hive for colony losses above 40%) acted as an incentive to report exaggerated losses, especially since the definition of “loss” in that program seems rather subjective. (“Weak” hives are losses.) Nevertheless, Ontario did lose a lot of bee colonies during winter 2013/14. The hardness of the 2013/2014 winter was undoubtedly a dominant factor. As Table 2 demonstrates, there is a close correlation between average December-to-March temperature and reported colony losses. Table 2. Over-winter bee losses and winter temperatures in Ontario. * Source of hive loss data is here. ** Kitchener, ON (Environment Canada), used as a proxy for southern/southwestern Ontario. The winter of 2013/14 was abnormally cold compared to the historical average for Southern Ontario and bee losses were high. However, winter 2014/14 in Southern Ontario was not as cold as in the Prairie Provinces where the bee losses were far smaller. Discussions with beekeepers indicate that an inadequate supply of stored food over the winter was a major reason for large losses in Ontario. Bees do not hibernate but cluster within hives and vibrate to keep warm. To maintain hive temperature they require a steady and large supply of food stored in the hive over the winter. This requirement increases in about February when brood production begins for the following spring season. Brood temperature must be maintained at about 34C. Some commercial beekeepers have described how they visited hives in March 2014 to replenish food reserves because of the unusually harsh winter. Some beekeepers did not (especially hobbyists, I’m told) and many of their bees starved/froze to death. I assume that in Western Canada, beekeepers automatically provide larger amounts of over-winter food reserves to ensure bee survival during their long winter seasons. Perhaps because of the 2013/14 experience, the Ontario Ministry of Agriculture, Food and Rural Affairs issued a new document in September 2014, Best Management Practices for Ontario beekeepers in Advance of Winter, with detailed advice on how to help bees survive. Factor 2: Pollination Services in Eastern Canada. One Ontario commercial beekeeper, who provides thousands of hives for pollination services in the Maritime Provinces, told me he devotes the entire summer after the bees return in July to rebuilding his colonies for the winter. He provides supplemental sugar-water solution as needed during the summer and collects no honey from them. He says he allows bees to forage on semi-abandoned farm fields in Northern Ontario with large numbers of wild flowers, and free from many of the pesticides and other chemicals associated with more intensive agriculture and more intensive human settlement. (He says golf courses are bad for bees.) In order to improve bee health, he has discontinued pollination of cranberries in Quebec when the bees return from the Maritime Provinces to Ontario. His loss percentage was still about 30% last winter, but only half of the official Ontario average. A contrast is the experience of another commercial Ontario beekeeper, comparable in size to the previously mentioned beekeeper. This beekeeper provides pollination colonies to blueberries in the Maritime Provinces but then uses them later for honey production back in Ontario. He reported hive losses in the 80-90% range for winter 2013/14. I also talked to a large commercial beekeeper from Eastern Ontario who does not ship hives to the Maritime Provinces or Quebec. His 2013/14 winter loss was only 9%. Although these examples are anecdotal and certainly don’t represent any formal survey, they do imply that long-distance transport of bees (i.e. migratory beekeeping) for blueberry pollination contributes significantly to Ontario’s high winter-kill percentage. It’s worth noting that large-scale shipment of bees from Ontario is a recent phenomenon. I’m told that no shipments to the Maritime Provinces occurred before about 2000, and the percentage of Ontario hives shipped eastward has doubled since 2010. In addition, with migratory bee services, shippers generally combine the hives supplied by several Ontario beekeepers onto single truck beds for transportation. This process may unintentionally facilitate the spread diseases/pests among bees, adding to the potential for losses. In a recent document, the Province of Ontario announced its intention to both increase migratory beekeeping operations for pollination and reduce over-winter losses to a maximum of 15%. That represents a very difficult challenge – probably an impossible one. It is not my intent to condemn the use of Ontario bees for pollination services in Quebec and Maritime Provinces. That’s a process which supports Eastern Canadian fruit growers and provides additional income for Ontario beekeepers. But this comes at a cost in terms of increased over-winter bee mortality. University of Guelph bee researcher Dr. Ernesto Guzman and his colleagues concluded in a 2010 report that varroa mites are responsible for about 85% of over-winter bee deaths in Ontario. Dr. Guzman stated recently he believes this percentage still applies. A measurement of only three Varroa mites per 100 bees is sufficient to pretty much ensure death for an over-wintering hive (Dr. Guzman, personal communication, and reference here). Varroa mites are considered the reason why wild honey bees (colonies which escape via swarming) no longer survive very long in the wild in southern Canada. However, during the course of their existence in the wild, be it in abandoned buildings, woodlots or abandoned beeyards, they become a biosecurity hazard as a breeding ground for varroa mites that may inflict damage (by providing additional Varroa load) to managed hives in the vicinity. Although some executive members of the Ontario Beekeepers Association have down-played the importance of Varroa mites while suggesting that management is now effective, routine and generally challenge-free (see here for example), my conversations with commercial beekeepers suggest otherwise. Varroa mite management remains difficult and involves some critical management choices on a regular basis. A typical beekeeper treats his/her hives in both spring and fall – never eliminating mites completely in the process, but knocking their numbers down enough for bees to carry on relatively unaffected. But mites reproduce quickly, so the process must be repeated often with great vigilance. This is not to imply that Varroa mite management is hopelessly difficult, but, rather, that it is far from simple or routine. Dr. Guzman’s conclusion that Varroa mites are responsible for 85% of bee losses in Ontario seems highly relevant. Varroa mites are also effective vectors for the spread of viral diseases (see here and discussion below). I’ll mention this only briefly as I don’t pretend to understand all of the complexities involved. 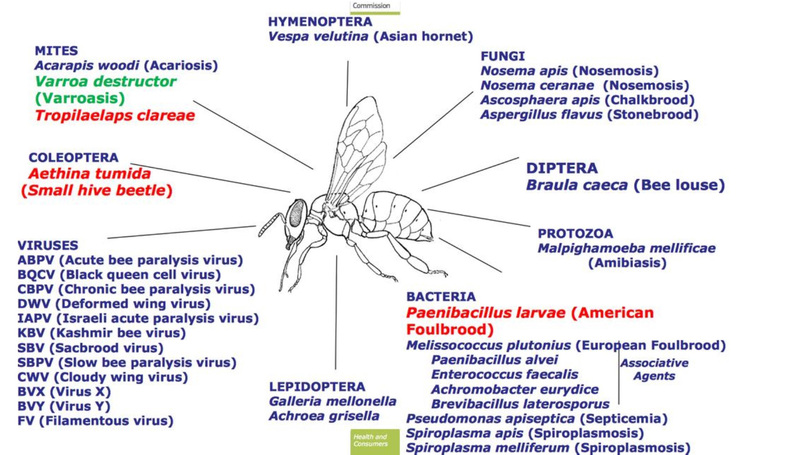 This diagram, borrowed from Twitter, shows some of the pests/diseases. Though the magnitude of their contribution to Ontario bee deaths still remains largely unknown, bee viruses are getting increasing attention, no doubt, in part, because of their linkage to Varroa mites. Unpublished survey research by the University Manitoba found that most of the bees sampled across Canada had the Deformed Wing Virus (DWV), and DWV has been directly linked to high winter loss of bees as well as Varroa mite infestation. I’m told that DWV symptoms can be very similar to those caused by central nervous system toxins like insecticides. For references see here, here and here. However, experts say that virulence depends on the intensity of the viral infection (just as with human colds) and information about viral infection intensities in Ontario seems to be pretty much non-existent. Insecticides have been long recognized for their negative effect on bees. Insecticides kill insects. Dimethoate (Cygon) is sometimes used by farmers for insect pest control (eg., soybean aphids), and special care needs to be taken to avoid application to flowering plants when bees are present. While bees tend to avoid plants treated with the pyrethrin (organic) insecticides, this class of pesticides is also very deadly if sprayed when bees are present. Neonicotinoid (neonic) insecticides are also toxic to bees; there is sufficient research and other evidence to indicate that, with certain “vacuum- type” corn planters, neonic seed treatments can cause acute bee deaths if neonic-laden dust comes in contact with foraging bees nearby. However, there is very little evidence to indicate that seed treatments contributed significantly to over-winter bee deaths in 2013/14 deaths in Ontario. While there is published research showing that exposure of bees to ‘sub-lethal’ concentrations of neonics can cause some abnormal behaviour, these are virtually all lab experiments in which bees have been treated with concentrations and durations of exposure beyond what is normal under field conditions. For two major reviews, see here and here. For further discussion see my previously posted columns, here and here. See also a recent update from the Pest Management Regulatory Agency of Canada. While no one in agriculture likes to be accused of poor management (it’s always more satisfying to blame someone else, preferably a big company), it seems obvious that good beekeeper management is both critically important and very difficult. Bee management is a very important factor in explaining differences among beekeepers in 2013/14 over-winter losses. In addition, bee management became far more difficult in Canada with the arrival of varroa mites. Beekeepers say it was once possible for anyone to keep some bees in the backyard, collect honey in autumn, and, with some simple steps, keep bees alive over winter. Now, without a lot of sophisticated skills for pest management, high over-winter bee losses are almost certain. Two successful, highly skilled beekeepers told me how they once turned day-to-day management of their hives over to someone else for a season. (The reasons were poor health and other business demands.) In each case, the result was a high over-winter loss percentage. Fortunately, in both cases, the loss percentages plunged the following year when the owner re-assumed direct and proper management of the hives. One commercial beekeeper told me that he now needs double-to-triple the number of employees per 1000 hives compared to years past. It would appear that a long, cold winter, inadequate over-winter nutrition, bee shipments to Quebec and the Maritime Provinces for pollination, and Varroa mites and other related diseases/pests were the dominant reasons for the large loss of Ontario hives in 2013/14. Differences in management skills were responsible for large differences among individual beekeepers. Pesticides were likely a minor factor. As for neonics specifically, one wonders: If these compounds did not exist at all, would the reported 58% over-winter loss have been significantly lower? Evidence suggests it’s doubtful – and this is before considering the alternatives which crop farmers would have used for insect management. If the Province of Ontario really wants to reduce over-winter colony losses, it needs to focus its attention on the important factors rather than the agendas of anti-pesticide lobby groups.